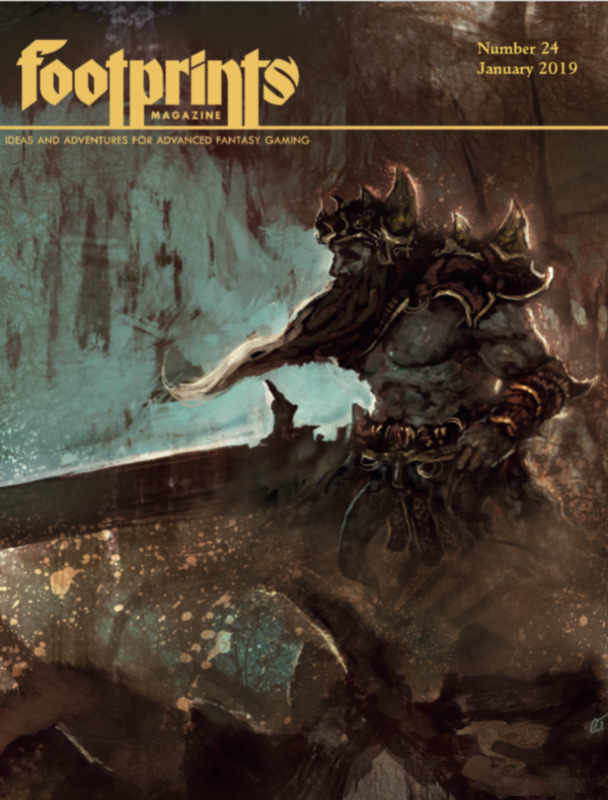 This is one adventure in the latest issue, #24, of Footprints, released by the Dragonsfoot community. This is a nine page adventure with about 43 rooms over several smaller levels. Featuring the ruins of some towers next to a river, and the dungeons underneath, it does a good job actually feeling like a ruin. Workmanlike, its writing could be more evocative and it relies a bit too much on history and explaining, but still manages to present a relatively terse and scannable room descriptions. This does a good job feeling like ruins. Vermin, ooze, rubble. There’s a (sery simple) ruined tower on each shore, each with a cellar underneath and then a hidden dungeon level that connects the two. Much in the same way the gatehouse in Stonehell or some of the ruin in MERP felt, this does a good job conveying a ruined feeling. The writing is serviceable. Note that I find about 70%-80% of adventures NOT serviceable, so, Good Job! It does a decent job using whitespace, bolding and formatting to call attention to and separate information chunks. This, combined with a writing style that is on the terser side of the house, make the adventure easy to scan and therefore use at the table. You can FIND things. It engages in some activities that makes sense. Destroy the evil mural or defile the evil alter and gain some XP. There are game world meme’s that make sense and this is one of them. It also does a decent job with some of the wanderers. A grey ooze wanders one level, and rather than a traditional table you roll to see if it’s in the room you just entered. Likewise one partially flooded level has giant leeches in it and the wanderer check determines if one has found you. It makes sense, and both contribute to the ruin-like vibe of the place. The rumors are also a cut above normal. They have a little context in them, and are tied in to the place in a way that makes them feel natural. Not quite in voice (Boo! Boo I say Sir!) they still are a little bit more interesting than the usual and show some work has been put in to them. Also, I’m never satisfied, so now is the time on Sprockets when I pick it apart. There’s a host of small issues. It might just be my eyes this morning, but the maps seem blurry, maybe made worse by their small size. Also, in quite an annoying fashion, DOWN stairs are noted on the map but not the up stairs. Yes, I think it’s always the first roo on that level that has the stairs, but it’s still a interesting choice to not put it on the map. The Leech wanderers turn up on a 1 in 20 checked each turn. My, that’s a lot of rolling! I wonder why this was chosen over a 1 in 10 every two turns? IN the past frequent wanderer rolling has seemed fiddly and cumbersome to me. I think “every turn” also paradoxically, is LESS interesting than every two turns. Every 2 feels like the party pushing their luck to stay inside, while every turn becomes routine, maybe? The text chooses to engage in some history and justifying, which stands out because of the otherwise terse nature. I stuck some example down at the end of this review. These add little to nothing to the adventure. The room with the big baddie and his minions is also interesting. It states that he goes to investigate disturbances on the level. I might have instead placed that text as a kind of preamble to the level, or in the first room, so the DM was sure to see it immediately. I’d like to focus on two things though. First, the order that information appears. One room in particular made me think of this. It’s ruined, a little flooded. “Olive slime has established itself here. Looking like scum on the water …” This appears a few sentences in to the description. In cases like this I much prefer to see a general description of the room, including scum on the water, up high/first in the room description, and then following that a little blurb about the scum actually being two patches of Olive slime. This organizes the information better for the DM during play. Second, and my major issue, is the workmanlike descriptions, which I’m using a little negatively here to describe a lack of evocative descriptions. Room 33 is the evil chapel and room 34 a throne room, and yet both have very little in the way of description other than the room title. A profane alter with 3’ of water in the room. The throne room is a little better with a water logged and rotting throne sitting on a dias, painted gold. Profane is a conclusion; the designer should show, not tell, something that makes the DM/players think “wow, that’s profane!” It is this lack of evocative descriptions that really keeps my opinion of this restrained. Again, evocative descriptions don’t have to be long, just a few words or a sentence that paints a picture for the DM. This room is completely empty. PCs may be alarmed by the presence of the fungi, but it is normal, harmless, and serves as food for rats. The Lord of the River Gate used to sit in audience here, pronouncing sentences on captives. Rats and other vermin got to the supplies that were stored here centuries ago. The water in this room (3’ deep) is inhabited by an evil spirit: a young woman that was hiding when the elementals flooded the dungeon. Once a plaything of the Lord of the River Gate, she now manifests as a water weird and exacts vengeance upon any living creature that chances upon the room. This entry was posted in Level 3, No Regerts. Bookmark the permalink. You’re not wrong about the maps. They are a little blurry, and small. Also, I don’t mind a little history as long as it’s not overdone. One of your examples above, “Hidden by a bandit that laired here a few years back,” is a perfect example. It’s short and concise. Does it add anything to the adventure? well, no but I kinda like that stuff as long, as I said, it’s not overdone. I also kinda like the backstory of the water weird. I suppose that kinda stuff could be added at the back of the module as an appendix. That way it could be easily avoided if not interested in that stuff. I see it as an opportunity for player-facing writing. Instead of taking away the history, add some details like graffiti, discarded equipment, town rumors, etc. that the players can put together and deduce the history of the bandit. I take responsibility for the digitized maps.I probably should of made them bigger and a couple of pages when I digitized them. I came in late to the game and was just trying to help do layout and push the magazine over the finish line. I felt weird making too many changes because it wasn’t my work so I was trying to keep everything as I found it and the hand drawn maps were all on one page. But yeah, in hindsight, probably should of made them bigger as it’s a pretty cool map idea. Some hard work went into the articles by the authors…and its a free download, so I recommend going to check it out! Is there no chance to change them now? Ultimately, that would be up to the editor/publisher. I can relay the complaint and willing to put in a few more hours of free time. If I made the maps bigger I would want to understand Bryce’s comment about the down stairs being shown but not the up stairs? I’m thinking the designer had a ladder that was the ‘up stairs’ which is shown in Room #1–left corner….heh, it’s super small. Same with Room #13 for the South Cellar. Is that the issue or is it something else? So sounds like a legend could be added too with bigger features. Made them bigger. I believe the update will be put out today or tomorrow. DCO does an amazing job of conveying a metric ton of history with no background info than a one page timeline in the back purely by “player facing” stuff. Deep Carbon Observatory by Patrick Stuart, a module that Bryce (and I would guess most folks here) fancies pretty highly. Thanks. I just bought a physical copy of that and and ready to dig in! Likewise, interested readers can check out previous Footprints issues and other modules at the Dragonsfoot site.